In Ride the Wave of the Tongue (Part 1), we explored the glide action of the tongue, that can move like a wave in the mouth, especially the forward/backward movement of that wave. That action helps to define the different vowel sounds you can make with your mouth, from "ee" [i] in the front to "oo" [u] in the back. Those two vowels are common to many of the world's languages, though they may be more with greater intensity than they are made in English. In other words, the "ee" [i] sound might be made with greater narrowing, with the tongue closer to the alveolar ridge, or the "oo" [u] sound might be made with greater lip rounding and the tongue arching further back. In foreign languages, we also encounter sounds not heard in English at all. For instance, in French words like "tu, une" are made with a vowel that is rounded like "oo" [u] , but is made with the tongue arched forward like "ee" [i]. The IPA symbol for this sound is [y], and the sound itself isn't all that hard to make. Lock your lips into a very tight kiss-like position, and say "ee". If you find yourself saying "oo", begin by saying "ee" and then round your lips forward while not allowing your tongue to move in your mouth. Using a mirror can make this easier, I find. The unrounded equivalent of "oo" [u] is represented in the IPA by the symbol [ɯ]. Again, to make it simply make an "oo" sound and then spread your lips wide. I find that this has a far less dramatic sound change than the change you get when you go from [i] to [y]. I also think it is harder to change your lips on this one without your tongue gliding forward to the "ee" sound. You will have to concentrate to anchor your tongue in the [u] position. 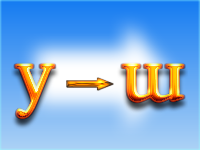 Though this sound is used in Vietnamese (they have both [u] and [ɯ]), it is used in some accents of English as a replacement for [u]. For people who never round their lips (think surfer "dudes" [dɯdz]), this sound is easy and practical. Some people might judge it as "lazy" in comparison to their own speech; I like to imagine it as being "economical." In our next step, we'll look at stopping halfway through the glide on two other new vowels, [ʉ] and [ɨ].